As the lights dim in Upper Tarble, the last of the audience members take their seats, and murmurs fade away into silence. The actors are scattered behind the curtain, some peeking through its narrow seam as others tightly clutch their props, preparing to bring them on stage. Mohammad Boozarjomehri ’19 then welcomes the audience, asking them to silence their phones. Then, midway through his sentence, his energy and voice sharply increase. “So buckle your seats for the Elizabethan ride of a lifetime!” he declares. He closes the curtain, leaving the audience in uproar. As the actors try to maintain their focus, Boozarjomehri recollects himself and walks through the curtain to commence the show with his opening line. 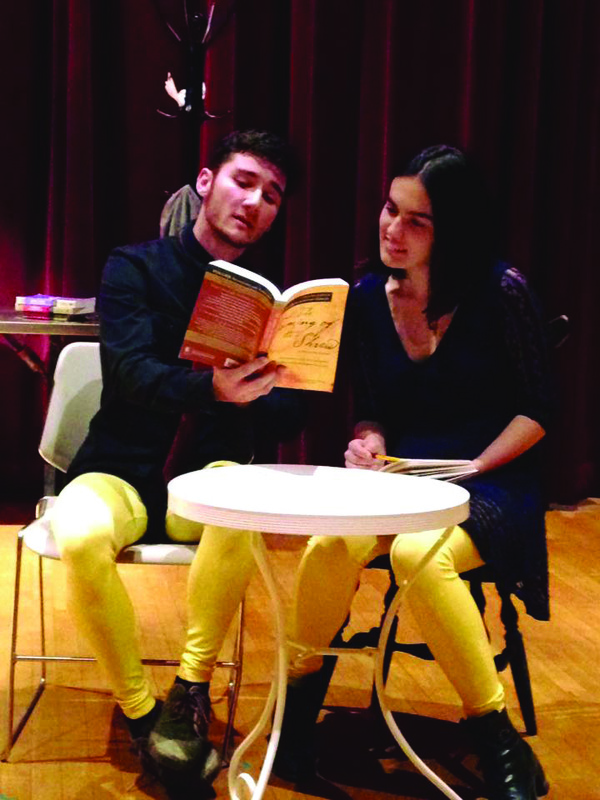 Thus began the Yellow Stocking Players’ Night of Scenes, an annual performance done by the Yellow Stockings shakespeare troupe with funding by the Drama Board. This year, under the guidance of playwright/dramatist Emma Remsberg ’17 and stage manager Emily Kennedy ‘19, the theme for the show was performance in daily life. Within the plays ; Hamlet, Much Ado About Nothing, Merchant of Venice, Taming of the Shrew, and A Midsummer Night’s Dream, and their characters, director Remsberg wanted to explore how people try to be who they are not, as well as the motives and consequences involved. This theme was evident during the party in the Much Ado About Nothing scenes where the characters’ faces were masked but their emotions even more so, and in the actual performances being done by the Mechanicals in A Midsummer Night’s Dream. “I wanted to explore performance in our daily lives, but particularly its motives and consequences. What drives people to disguise themselves like that, and is it successful? In our scenes, it usually isn’t—I tried not to be too heavy-handed with this, because our show was a comedy, but that kind of performance proved to be largely destructive, and even the scenes that ended happily were left without full resolution,” said Remsberg. This year’s Night of Scenes began back in September with auditions in Trotter Hall. Remsberg, Kennedy, and a Drama Board liaison, chose the cast members for the show, with all current graduating years represented. From there, cast members attended rehearsals scheduled every week, and worked towards being off script by the end of fall break. During those rehearsals, stage positions were given, lines were memorized, characters were formed, and at times emotion and stress levels were high. Tessa Hannigan ’20, who played the role of Hamlet and Actor 9, recalls the difficulties she faced during that time. “For me, the process of bringing my character to life was marked as the process of diving in without knowing what I was doing, simply trusting a feeling of who my Hamlet was and could be. Lines took a long time to memorize but the most important step I had to take in becoming my character was embracing the fear of failure and jumping in!” said Hannigan. As the days until the performance narrowed, the actors warmed up, acted, and worked more as a community, with the guidance of Remsberg and Kennedy. Two months after the initial audition, Remsberg and Kennedy, the self proclaimed “mothers” of the group, look on as the actors take their final bows, and conclude their final performance of The Yellow Stocking’s Night of Scenes. “There is nothing more incredible than being able to sit back and watch the progress a group of individuals who come together with the common goal of producing a show and see what they become. I have the honor of watching my actors grow as actors, but also as people in general, and there’s nothing else I love more!” said Kennedy. Among those who attended one of the four scheduled performances, was Ming Ray Xu ‘20 who attended the Saturday matinee. “I don’t read a lot of Shakespeare, but I enjoyed the blending of its themes of performance and the convincing portrayals by the actors. Even though the story did not strictly adhere to previous Shakespeare stories I have read, the acting allowed me to follow what was going on for the majority of the play. 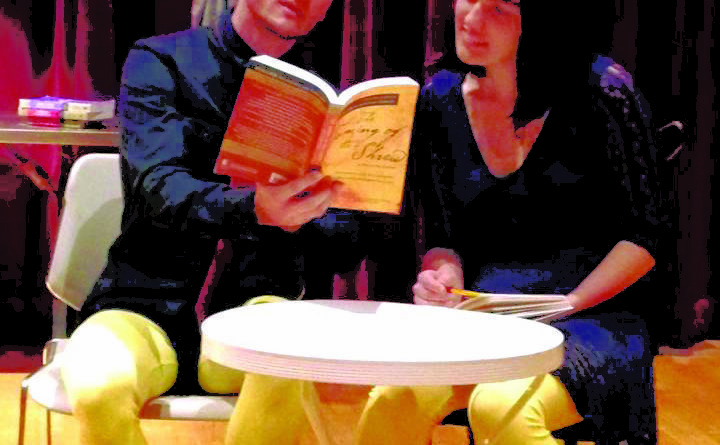 I am definitely open to watching more Shakespeare in the future…if Yellow Stockings puts it on ” said Xu.